In the following pages an endeavour has been made to summarise the progress, and describe the Sporting varieties of the dog as they are at present known, and, I believe, appreciated, in the British Isles. 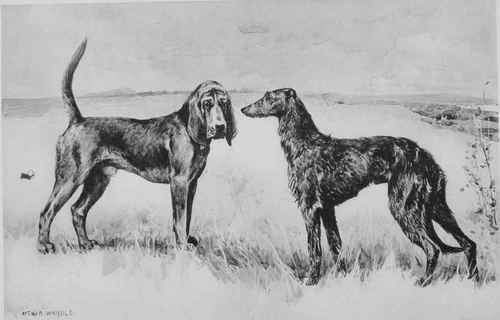 Without losing any of the early history, my wish has been to introduce matter bringing the subject up to date; not only so far as the work of hounds and other dogs in the field is concerned, but as they are as companions, and when wanning, or attempting to win, prizes in the show ring. One or two new features have been introduced, or rather revived, the most important change being in connection with Mr. Wardle's illustrations. With three exceptions these are not portraits, although originally drawn from living examples. They are to be taken as typical specimens of the various breeds they represent. The reasons for this departure from modern custom will be obvious; and no doubt, for future reference, such pictures must be more useful than any portraits of individual dogs could be - dogs whose prominence before the public is more or less ephemeral. By Rawdon B. Lee, Kennel editor of "the field," author of the histories of "the fox terrier," "the collie," etc. The Illustrations by Arthur Wardle.